"SCT’s 365 Online Class was so popular in 2017 that we’re bringing it back for 2018, too! Another year is coming to an end and you’ve probably amassed quite a collection of memories and photos. 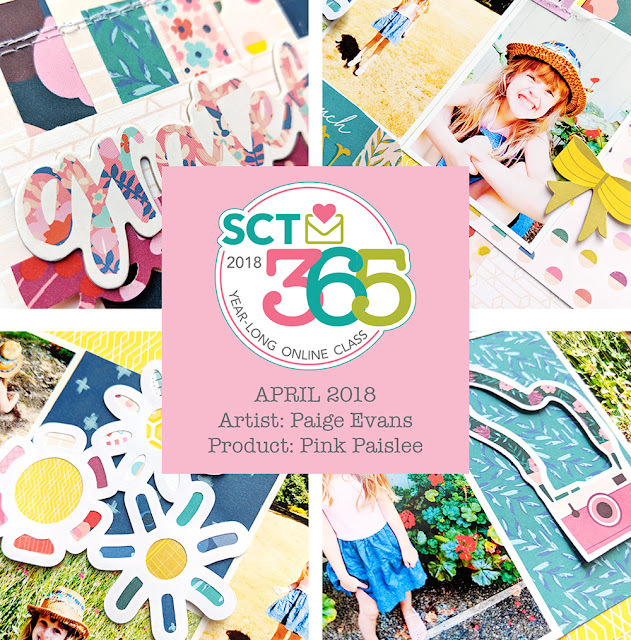 SCT 365 is the perfect class to help you get those moments off your computer (or out of a shoebox) and onto pages in your family album, one month at a time! This double-page, sketch-based class features exclusive PageMaps sketches, trendy techniques (all spelled out in photos), a monthly bonus card, cutting files, complete instructions and so much more. We’ve lined up an all-star cast of your favourite teachers, including Lisa Dickinson, Kelly Goree, Becki Adams, Paige Evans, Meghann Andrew, Jana Eubank, Jen Gallacher, Nicole Nowosad, Anya Lunchenko, Bea Valint, Stacy Cohen and Sheri Reguly! On the 1st of each month, the new content will be available to you in the online classroom on the SCT website. Best of all, the content is available to you all year long so YOU can set the pace for this class. This class starts on January 1, 2018. Are you ready for the amazing price? Only $25US/$28Cdn for this complete year-long class!" To enter the giveaway to win a free spot in this year-long class, leave a comment on this post and tell me what is your favorite month of the year and why?! I will randomly choose a winner and update this post on Wednesday April 4th 2018 so make sure to check back then! Open internationally, please only comment once :) Thank you and good luck! My favorite month of the year is December, is a month full of family reunions like Christmas and new year when we get together to eat, celebrate and share happy moments. and since 2016 my family has a new celebration motive! The birthday of my wonderful nephew. I love October because there is Halloween: I am in love with all the creepy things, films, charachters, fair, events! I love October because it is my birthday month!!!! Hello Paige! I love April because it so uplifting to see fresh life arising in nature! I love October! The leaves are changing, the air is cooler and it's the main run of football! Such a great giveaway!! I have 2 favorite months. May- lots of birthdays- one being mine, all-family get together, Mother's day, and school lets out! December- Christmas has always and will always be my favorite holiday. The sights, sounds, feelings. We get the opportunity to celebrate Jesus! I love May because is the flowers month and the summer in knocking on ours doors, !! I love June. It is the start of the summer which means spending time in the pool with family and friends. December for the win! A month of giving and receiving gifts and remembering the greatest gift of all, God's Son!! I'd have to say June, the begining of summer! Hi Paige. My favourite month is April. Here in Australia it's Autumn which means beautiful mild weather, Easter usually falls in April and my favourite day falls on April 3rd - LOL my birthday. I LOVE the month of June, it's the beginning of summer and warmer weather here in the north. More time spent outside in the sun with family and friends. That is a tough question! I like so many months for so many different reasons. September for family birthdays and camping, October for the fall feel, November for my birthday and Thanksgiving and December for all of the fun events and Christmas! I love June because everyone is out of school (including my husband who works at a school) and we get to relax. I also love August because everyone goes back to school and I get time alone and a quiet house again!